The Wall Street Journal has a fascinating look at the dominant Seahawks secondary, which seems to have been able to turn just about everyone into a star. Part of that is the remarkable amount of pressure they bring, but another part—perhaps—is as brilliant as it is simple. Maul receivers, because there's no way officials will throw flags on every play. 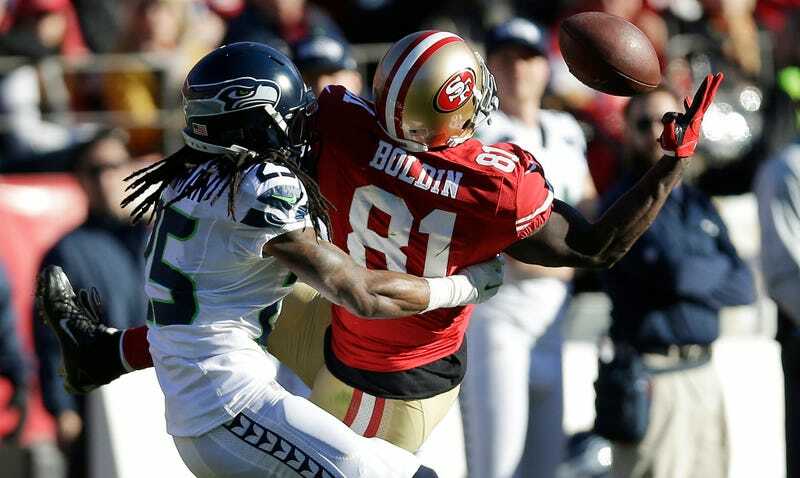 The Seahawks were tops in the league in defensive pass interference penalties, and were among the leaders in defensive holding. But as we've learned, penalties probably don't correlate with success one way or the other. Instead, the key might be all those plays that could have been called but weren't. "They look at it and say, 'We may get called for one but not 10,'" said Mike Pereira, a former NFL vice president of officiating who is now a Fox analyst. Seattle defensive coordinator Dan Quinn said the calls so far are not a huge cause for concern, other than making sure the players remain aware of how the games are being officiated. "It's nothing that we get too wrapped up in," he said. "The thing we try to do is just educate what's going on around the league, in terms of, 'This was called in this game. This was called in this game.' ... [F]or us, it's important just to know what's kind of the climate of how it's being called." How do you figure that out? Easy enough. Mug receivers early on and see where the line is. In the WSJ piece, Pereira says the Seahawks "test" referees early in the game "to see what kind of tone the officials are going to set." This isn't evil, it's genius. Seattle knows that even if it fouls on every play, officials know they'd be the ones to catch hell for throwing too many flags. Football's always been about doing whatever you can get away with—you can find offensive lineman holding on just about every play—and you can get away with an awful lot more in the playoffs than you can in the regular season. So, good luck, Saints.